What do U.S. Presidents Buchanan, Grant, Harrison, Pierce and Arthur have in common? These five presidents favored Cape May as a summer retreat when they were in office during the second half of the 19th century. The cordial reception and privacy afforded the Presidents at Cape May’s Congress Hall provided them a welcomed respite from politicians and the sweltering hot summers in Washington, D.C. Although some of us might not be able to afford to vacation in the popular summer months like a US President, a fall visit to Cape May during the week offers cheaper accommodations, dining and entertainment. It may be a bit chilly for swimming, but the crowds are gone and the days are still sunny and pleasant. 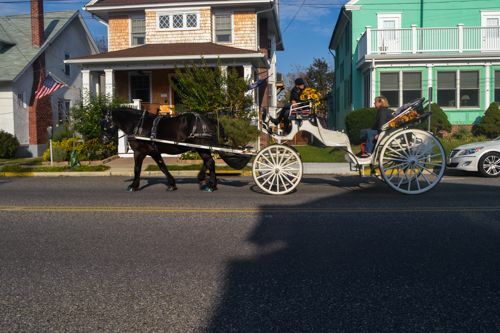 If you want to see the “other” Cape May, put on some comfortable walking shoes and discover Victorian Cape May in the fall. 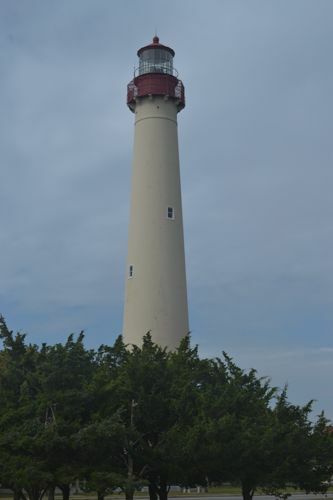 For the best view of the cape, head for the Cape May Lighthouse, located at Cape May Point State Park. If you climb the 199 steps to the top you might end up out of breath, but you won’t be disappointed. Circle the outer walkway at the top of the lighthouse and you’ll see the Jersey Cape where the Atlantic Ocean and the Delaware Bay meet. 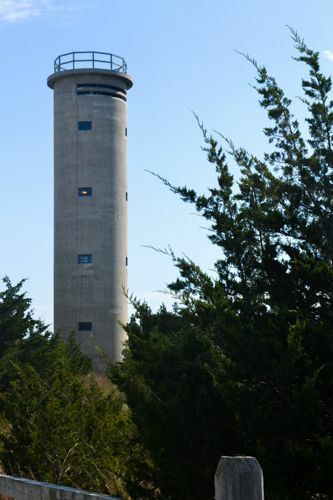 As you look out toward the beach you’ll be rewarded with a view of an historic, but deteriorated World War II bunker. During the war, the southern New Jersey coastline was in danger of enemy invasions and attacks from hostile warships. As a result, the US Army Corps of Engineers built the bunker which contained heavy artillery and was manned by naval gunnery crews. Take a moment to stroll around Cape May Point State Park where you’ll discover a prime bird-watching area for fall migration. Hawks heading south toward the Delaware Bay first pass over the narrow corridor of land along the Cape May peninsula. A number of trails give you a view of various ponds, coastal dunes, a marsh and forest habitats. Take the Red Trail and you’ll come upon an observation platform overlooking freshwater ponds where you’ll be able to see wading birds, swans and ducks. 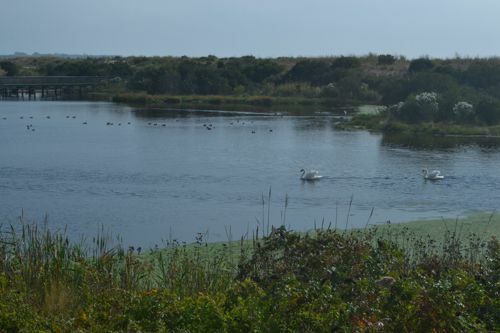 Different habitats including coastal dunes, the wetland marsh and the beach are accessible on the Yellow Trail. Follow the Blue Trail along the beach where you’ll have a chance to see flora and fauna as well as shore birds. Continue down Sunset Boulevard until you reach the beach. 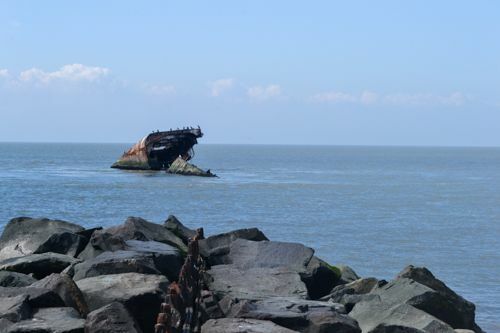 About 150 feet off the coast of Sunset Beach you’ll see the remains of the S.S. Atlantus, an experimental concrete ship. There were twelve built during World War I, but were proven impractical because of weight. In 1926, the Atlantus was to be used as a ferry dock for a proposed ferry between Cape May and Henlopen, Delaware. A storm hit and the Atlantus broke free of her moorings and ran aground, where parts of the concrete ship remain today. Take a stroll or a horse-drawn carriage ride through the town’s historic district and enjoy Victorian architectural styled homes with spirited colors and gingerbread trim. Gurney Street off Beach Avenue has a number of colorful Victorian homes. If you want to get a real taste for Victorian lifestyles, make sure you visit the Emlen Physick Estate, an 18-room Victorian house museum, built in 1879. Here you’ll see how both the wealthy and their servants lived during the late 19th century. Need a break from history and the Victorian way of life? Wander over to the Washington Street Mall, an outdoor concourse closed to traffic. Here you’ll find everything from ice cream parlors and sidewalk cafes to art galleries and candy stores. Did I mention Captain Kidd’s ties to New Jersey’s southernmost tip? The notorious pirate visited Cape May during the 17th century, long before our distinguished presidents, but not for a summer retreat. Rumor has it that Captain Kidd allegedly buried some of his stolen treasures close to the Cape May Lighthouse near a tree that came to be called Kidd’s Tree. The tree was supposed to help lead Kidd and his crew back to the buried treasures. But Kidd was captured by the British and hung. He claimed, until his death, that he buried some of his treasures in what is now Cape May Point. Unfortunately the tree was cut down in 1893 and the treasures never unearthed. One can only imagine what lurks beneath the sands at Cape May Point. If You Go by Air: Philadelphia International Airport serves all major airlines and is about an hour and forty minutes to Cape May. Driving: From Philadelphia-Take the Ben Franklin or Walt Whitman Bridge to Rt. 676 south. Follow signs for Rt. 42, Atlantic City. Take Atlantic City Expressway to Exit 7. Take Garden State Pkwy. south to Cape May. From New York and New Jersey-Take the Holland or Lincoln Tunnel, or the GW Bridge to the NJ Turnpike south. Get off at exit 11 and take the Garden State Pkwy. south to Cape May.